My recent post about Wellbeloved's Deptford High Street premises prompted some interesting correspondence with former Deptford resident Ronald King, who sent me some fascinating memories from his formative years in the 'ford. Ron, who is now 81 and lives in northern England, sent this wonderful picture of his school class at Stanley Street school in 1937. 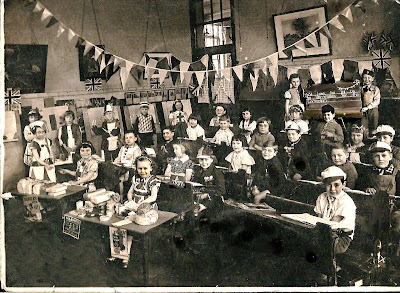 The writing on the blackboard reads: "We have just put up the decorations for the Coronation"
His memories paint a colourful and revealing picture of the excitement of Deptford High Street from a child's eye view, during the 1930s, and the devastation that the war wreaked on families and day to day life in the area. Ron writes: I can only offer an old man’s disjointed ramblings but do so with the hope that they may trigger recollections in those with more intimate knowledge. I come from an old Deptford family, poor but honest: the area around Grove Street was for many years infested by 'my sisters and my cousins and my aunts' ... well actually not my sisters. My memories of the High Street date from about 1935. I lived – aged 5 - at No 8 Amersham Vale, a short walk away via Douglas St. I remember...the barrows at the Douglas St/High St junction where you could buy almost anything at bargain prices...Woolworths, who really did sell things for 3d. and 6d….including TOYS!...the large 'barrel' suspended over the pavement near the station. I was convinced that it would come crashing down on somebody one day - I gave it a wide berth. The bracket that held the 'barrel' is still there over; Ron identified it as the one above the Monis clothes shop. I remember...the shops decorated for the Coronation, large golden crowns made of cardboard which disintegrated when it rained and of course, flags...the market with two entrances from the High St where stalls sold cotton and buttons - and my special interest - books of all kinds, and pencils...the darkness of the streets after leaving the bright lights. In 1937, the landlord 'encouraged' us to move to Windmill Lane, No 61, still within walking distance, even if you are 7. We continued to shop there regularly. I remember...THAT BARREL...(I still do not know what it was for)...again Woolworths, this time batteries and torches and watches and gramophone records, Decca and Rex...and German tinplate toys. Toys were becoming more war-like; I remember being given a model lorry, fitted with a searchlight and a morse key together with a copy of the Morse Code. That's where I learned it and have never forgotten it...the 'Showground' on the same side as Woolworths, with lots of coloured lights and fairground games...Marks & Spencers, at that time a Woolworth clone with similar island counters and selling similar stock...the night-life - not clubs and bars, but shops. They used to stay open late in those days, and being brightly lit would be a magnet for people who worked during daylight hours. Roadside barrows would have Naptha flares which gave a brilliant light and a loud hissing sound. One of the butchers shops would close and re-open later to sell saveloys and pease pudding to waiting customers..pavement artists, many ex-WW1 some without limbs...a man with no arms, drawing pictures with his feet...two buskers playing phono-fiddles outside the pub...my first sight of a coal-effect electric fire in a shop window..magic..we had no electricity though...all this at the 'top' of the street the Broadway end (why was it called the top - it was the southern end???). At the 'bottom' was the cinema known as the Deptford flea-pit...Pecry’s an open fronted drapery shop, where my mother would 'pay-off' items which were then reserved for whenever she had fully paid for them..I can still recall the excitement of making the last payment and proudly taking home new sheets or material for curtains. I remember Maines(?) a similar kind of shop on the other side of the road...Sainsbury’s...gleaming white tiles...Edwards the baker who sold round flat bread puddings at 4d each...Saunders with free-standing bowls of dried fruit, peas and lentils, some outside the shop, with a scoop to fill bags and take to the counter...was this the start of self-service?.....the wonderful bakers on the corner of Douglas St...shops opening up their cellars at Christmas to sell toys; not their usual line...then...the war..no more bright lights...pavements covered in broken glass....signs where the windows were, saying 'More open than usual'. We were 'bombed out' of Windmill Lane and after living in a trench in Deptford Park (I believe one of 7) with 5 other families, for some weeks went to pick hops in Kent. This took about 3 years, but we returned to Deptford in time for the V1 flying bombs Again we were 'flying bombed' out and had to emigrate to Bermondsey. My first job after leaving school was in a radio shop (I was even then mad keen on anything electronic) called Evelyn Radio. situated would you believe, in Evelyn St. close to the bottom of the High St. I remember...1946/47 was not much fun...rationing was still in force...the Blackout returned due to power cuts...even shops (like ours) that had electricity, were not allowed to use it during certain hours, not a good time for any shopkeeper..my cousin Eileen getting her first job in a self-service mini-market at the top of the High St...one of the first supermarkets? After leaving Evelyn Radio I had no close contact with the High St until around ’56 when I came back to work in Boyds, part of the GUS group, as a TV engineer. This shop was on the western side fairly close to New Cross Rd. I remember...the changing demographics...the area manager coming into the shop just before closing time with another man whom he introduced to the manager as 'the new manager, starting on Monday morning...'! This happened twice during my time at Boyds. Luckily, TV engineers were harder to replace than managers! Thanks for that clarification Bill, I was basing my guess on the distance to the station *adjusts glasses*. Priceless stuff, thanks for those memories Ron. The bakers on the corner of Douglas Street was Johnsons, when we were kids, we used to stand with our backs against the wall in the winter to keep warm from the bread ovens. Would love to see old pictures of Giffin Street, number 5 in particular! Loved reading this! Any more memories Ron? Thank you Anne,I have only today read your comment.If you are interested in 1930's Deptford,you might like to read my sisters memories of this period. email me if so. 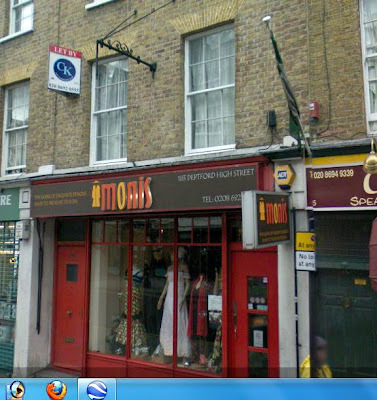 I'm told I have ancestors that ran a shop in Giffin Street, don't know the name or number but their surname was Stride but the shop was owned by their daughter in law Florence Stride nee Morley. Hello is ron still alive please? The photo with Pecrys in it concerning the road on the right is Frankham Street. Hi Ron and all. My dad was born in 1931 at 2 Windmill Lane. I recall him telling me of his mum being bombed out several times. He did not speak of his childhood much but with his recent passing we are finding a whole ton of stuff including his Identity Cards. It seems Windmill Lane no longer exists. Wondering if you could tell me roughly where it was. Thanks Richard Linden. Hi Richard, thanks for your post. Windmill Lane ran between Grove Street and Evelyn Street. The Grove St. intersection, was opposite the gates of the Royal Victoria Yard. the "Vitlin Yard" as we knew it. The gates have been preserved. If you draw a line from the gates South until it reaches Evelyn St.(Lower Rd.) you have the position of Windmill Lane. No 2 was at the Southern end on the East side of the road. I wonder if I was at school with your dad? My 2x Great Grandfather was Joseph Green who lived at 239 Grove St Deptford from the late 1920's until his death in 1934. I believe he was living with his sister Kate who was Potter, then Dixson. Does anyone recall the Green/Potter/Dixson clan? My great uncle and aunt Abraham and Caroline Mandalstam were publicans of the Prince Regent Deptford High Stfrom 1911 until about 1927. He came from Riga Russia. My great incle and aunt Abraham and Caroline Mandalstam were publicans of the Prince Regent Deptford High St from 1911 until about 1927. He came from Riga Russia. Abraham Mandelstam was born c1857 in Riga, Latvia (at that time part of the Russian Empire). In 1878 he married Caroline Morris in London, about a year later their son Morris was born. (According to the 1911 census return, signed by Abraham, there had been a second child of the marriage who was no longer alive.) A cabinet maker (1881 census), and then a tailor, before becoming a publican. Abraham (and family) were naturalized on 11 September 1894, the certificate being signed by the Home Secretary H. H. Asquith. In 1898 he became a Freemason. In 1901 he was still a tailor on the census, but appears to have been running the Royal Standard P.H., North Woolwich soon after. Before coming to Deptford he was the licensee of the Bell and Anchor P.H., Dock Road, Canning Town. Nu X turn left: a comics and art garden party.